Over the weekend, temps reached in the 50s (10 C), and I was itching to get outside and take advantage of the partly sunny skies. 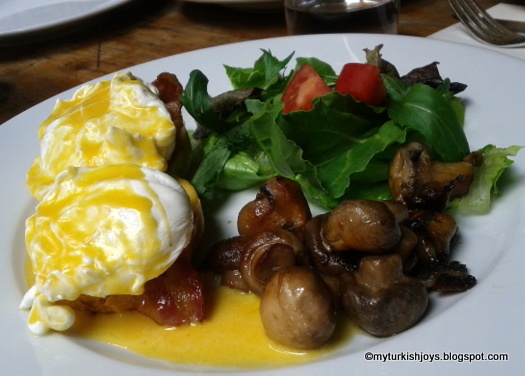 My delicious Eggs Benedict at White Mill Cafe in Cihangir in Istanbul. Along the residential streets in Cihangir and elsewhere in the city, you’ll find trees full of spring blossoms. Although we’ve had a mild winter in Istanbul, these flowers definitely make me cheerful. We decided to work our way down to the shore road because we planned to take an afternoon vapur from Karaköy to Kadıköy. On Sundays, the vapur comes every 30 minutes instead of the normal 20 minutes on other days. One of the things I love about Istanbul is that you can always discover something new. This lively metropolis is constantly changing. For me, that means more opportunities for some cool photos. We turned down a random street in Cihangir that we hadn’t been on before and walked down a flight of cement stairs. Suddenly, we were facing the beautiful Bosphorus and the Nusretiye Camii, which is in front of the Istanbul Modern Museum. We both were in awe for a moment. When you’re not expecting such an incredible view, it literally takes your breath away. Looking at Nusretiye Camii from the park, with Sultanahmet in the background. Located by and slightly above the Tophane-I Amire Culture & Arts Center is a random park called Sanatkarlar Park. Now, I’ve walked behind and in front of the arts center building several times and somehow never noticed this very small park. There’s nothing special about this park per se, but it’s definitely worth searching out for the views that we discovered. The minarets on the Nusretiye Camii act as the perfect framing device for photos. Of course, there’s a small shack nearby where you can order çay, sit on a stool and admire the seaview below the park. We walked down a worn, muddy path through the park, past an apartment building, through a parking lot and then we were on Defterdar Yokşu (Street). This is the main street that runs down from Cihangir and through Tophane to the shore road. I’ve also walked down this road several times, even just a few days ago, and didn’t notice this view below in my photo. Again, I was confronted with another excellent view of the city’s architecture. This time it was the domes of Mimar Sinan’s Tophane-i Amire Culture & Arts Center on the left and the Galata Tower to the right that caught my attention. Maybe it was the partly sunny skies. Maybe it was the spring blossoms. Maybe it was the happy discovery of a new place. No matter how many times I walk the streets here, I always discover something new. @Alyson, I haven't been to Bebek in a long time. The last time I went to Happily Ever After in Sept. I had the huevos rancheros and was disappointed. Not sure why I expected it to be better than it was. ;-) But I'd venture up there to try again. Actually, the best Eggs Benedict I've had here was at Delicatessen in Nisantasi with REAL bacon too. I cant believe, we have taken the same path it seems, walking down to the Modern Art. I loved the view from that park. Hope to see you next time we are in town. @Ilke, How funny! It's very random to end up that park, but it definitely has some great views of the Bosphorus. Only place to get Eggs Benedict in Bodrum is at home - But what you have in Istanbul usually filters down to us eventually. 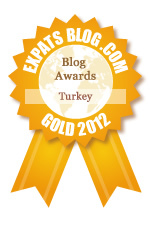 A great path and wonderful discoveries - loved the look of spring in Istanbul and your egg benedict! I am drawn to Cihangir area more and more, so much going on there now; enjoy! @Ozlem, thanks dear! There seems to be so many changes happening in Cihangir as well as Karakoy lately. So many new places to discover. Keep wandering!